Tomorrow night, the first of seventeen cheftestants will be told to pack their knives and leave. Top Chef is back, and they’ve brought their biggest cast ever for Season Five. This time, DC and Baltimore are both represented: Carla Hall, chef and owner of Alchemy Caterers, is our hometown favorite, and Jill Snyder of Red Maple hails from Charm City. Eager to learn more about our local competitor, I reached out to Carla through Alchemy. She was really sweet and eager to talk to local writers, so we scheduled an interview through Bravo’s publicity folks (a necessity to ensure that candidates don’t give away anything TOO juicy). 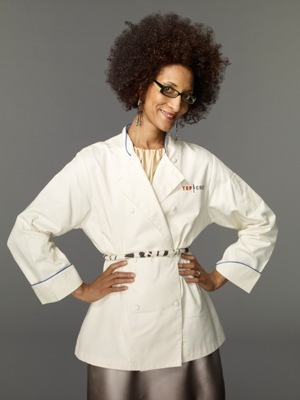 If you’re like us and can’t wait for Wednesday night to come, this chat with Carla Hall should help to tide you over. We started out talking about Carla’s approach to cooking – something she’s probably discussed dozens of times since the show started taping. But she was gracious, taking the time to explain that her approach can be best described as “elegant comfort food.” Her biography on the Top Chef website talks about her introduction of classic French techniques (honed at Bethesda’s L’Academie de Cuisine) to traditional Southern recipes, and her description seems to sum that up perfectly. Carla and the folks at Alchemy Caterers take it even further than that: it’s about changing the way people experience food. They source much of their produce and heritage-breed meats from local producers like Tuscarora Farms and South Mountain. And Carla works with her clients to get an understanding of who they are, then she uses that to inspire her dishes – she will completely rework a dish or just make a few small tweaks to better suit a person based on their interactions. More insights into DC’s next Top Chef – including some of her favorite dishes around town and former cheftestant Spike Mendelsohn’s take on Carla – after the jump. Carla was introduced to Top Chef by her husband, who saw the show and knew right away that it would be perfect for her. But she’s certainly caught up quickly. When I asked if there were any previous contestants whose performances she hoped to emulate or to avoid duplicating, she said she admired Antonia and Stephanie from last season but then she reached back to Season 2 to say she definitely didn’t want to come off as arrogant like Marcel did. And when talking about whether she felt odd being one of only two caterers competing, she correctly pointed out that there have been several caterers who have done fairly well in previous seasons before suggesting that her combination of catering and restaurant experience gave her a leg up approaching group challenges. Some background on Carla – she’s a Howard University alumna who studied accounting and hated it. After college she modeled in Europe for three years, where she developed her love of classic continental cuisines. When the cooking bug bit she worked for a lunch delivery service for five years, gaining valuable real-world experience before her stint at L’Academie de Cuisine. In fact, she credits her on the job training for preparing her for the rigorous coursework. “I trusted that it was where I was meant to be,” she said. I asked about her time on the show, and although she couldn’t give many specifics, she said the experience of living with so many strangers in tight quarters was “interesting.” As she put it, “I remember my 20’s, but I don’t want to live like that again!” Her tidy nature was put to the test by the living arrangements. Among her competitors, Carla said she made fast friends with Baltimore’s Jill Snyder – apparently DC and our neighbor to the north contributed the two tallest females to the cast and they bonded above their opponents’ heads. She also felt a quick connection with Ariane Duarte who runs her own restaurant in Montclair, New Jersey. How does she feel about representing DC on the show? There’s definitely some pressure, but Carla welcomes the opportunity because the DC community has really embraced her. She says local residents seem “happy to finally have a homegirl” on the show. As a local chef herself, Carla is pleased with the increasing attention that the DC restaurant scene has been receiving, both from the media and from serious chefs who are drawn to DC by L’Academie de Cuisine, the abundance of fresh, local produce and the great local chefs already working here. Some of her personal favorites when dining around the District include the luxurious lobster burger at Central Michel Richard, the charcuterie boards at Sonoma on Capitol Hill, and a wide range of menu options at Nicaro up in Silver Spring. Carla seems to be taking the whole experience in stride – she hasn’t really had many people recognize her from the promos yet, and she said she’d let her husband take care of reading the blogs (though she certainly comes across as tough enough to handle haters on her own). She isn’t even planning to make a big deal about the premiere. In fact, she’s scheduled to teach a cooking class that evening at the new CulinAerie cooking school on 14th Street near Thomas Circle. The two-part class (Cooking Basics One and Two) will run from 6:30 to 9:30 this Wednesday and next, and spaces for this introductory instruction are still available at CulinAerie’s website. Set the DVR and then spend the evening with a star! 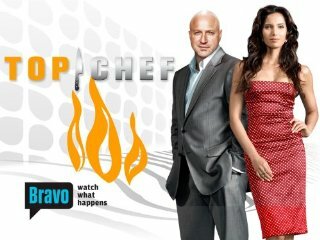 Unlike Carla, DC’s established Top Chef will be watching this season’s premiere surrounded by friends and family. 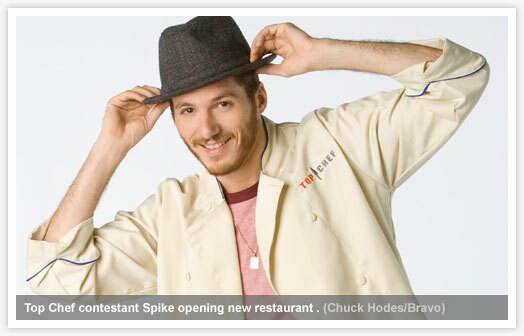 Spike Mendelsohn invites everyone to join him at Good Stuff Eatery to watch the season premiere. He’ll be sending out comments throughout the show via Twitter (no word on his username yet, so stay tuned) and they’ll be offering free wifi for anyone who wants to follow along online or maybe join in Endless Simmer’s regular liveblogging of the show. Carla’s summation of the whole experience really impressed me: “I will always try to find my flow – to make sure my voice is heard and I stay true to myself.” Here at Capital Spice we’re cheering for the home team and hoping she stays true to herself all the way to the finale! God help me, I LOOOOOVE Carla! She is the perfect woman rolled into one – an ex-model with a degree in accounting, a fabulous chef, a great wife and mother. And no attitude, just sweet, sweet, sweet! I really hope she wins! I saw Carla at the Shirlington movie theatre with her husband back in January, but I couldn’t place her in the moment! Nobody else seemed to really recognize her either. GO CARLA….TEXAS IS PULLIN’ FOR YA!!!! What a refreshing, poised, classy lady. If you had your own show, it wouldn’t matter what the subject was…I’D BE WATCHIN’….you’ve definitely got that “something” on camera. You should be on tv regularly!! Good luck! Wheaton, MD is behind you all the way. Carla – I knew from episode one that you would be in the top! Praying for you to win! I cheered when you won in New Orleans. My daughters and I love you! You go, girl! I’m pulling for you all the way, Carla! I was rooting for Carla; I felt so sad she didn’t win the title because I truly believe she deserves it more than the two gentlemen she compete with. I wish all the best for CARLA. She brought a whole new meaning to the competition where dog-eat-dog mentality reigned in that arena. Never thought I’d cry… for a cooking show! I wish Carla will have a cooking show someday! carla was my favorite and she kept the show interesting with her cooking and funny sense of humor, she was great!